This Lecture will be held at ASM in conjuntion with the Holiday Party and Silent Auction. Doors open at 7:00 pm. Overlooking the scene of a bison jump site, Two Medicine River Valley, Montana. Bison bone located below the cliff indicate its use between A.D. 1400-1500. The cliff in the foreground marks the end of multiple funnel-shaped drive lines that extend onto the prairie. 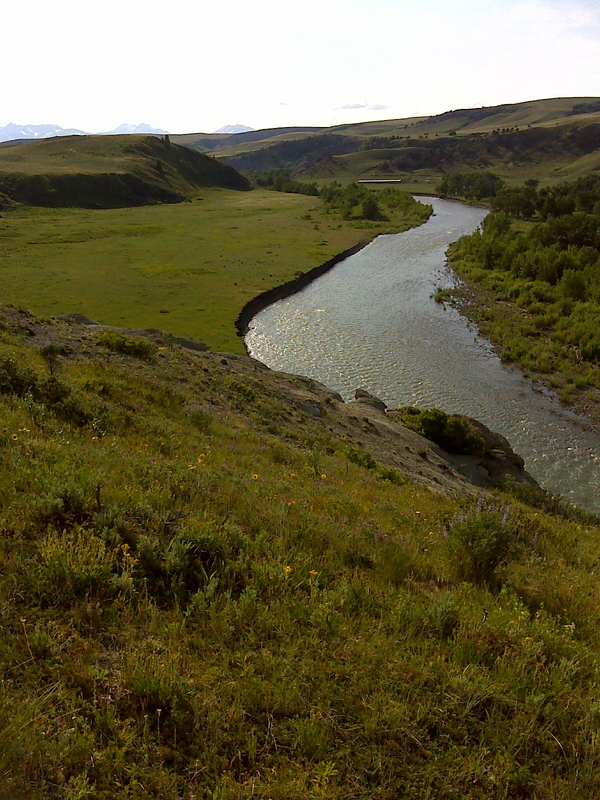 Bison carcasses were butchered and processed on the small floodplain below. Large and small residential sites occur in the distant background. The mountains of Glacier National Park can be see on the horizon. Monumental architecture, such as pyramids and platform mounds, is usually vertical, and it symbolizes power and the conspicuous consumption of human energy. Our modern landscape shows that vertical monuments are generally accompanied by expansive spaces where energy is extracted, features which we describe as horizontal monuments. We extend this relationship into the prehistoric past to demonstrate the complex social behavior of prehistoric bison hunters. Our example is the Two Medicine River Valley of Northwestern Montana, a valley that was communally visited by bison hunting societies during the Old Women’s phase, ca. A.D. 1000-1700. In 2012 The Kutoyis Archaeological Project (KAP) mapped architectural features that are nearly imperceptible at the scale of individual rock piles and tipi rings, but connect to form vast webs of bison drive lines, residential camps, tombs, and monuments built by a flourishing society of bison hunters only centuries before European contact. More than 6,500 individual cairns were point-located this year to reveal a glimpse of what may be the most complete bison drive line systems yet documented in the Northwestern Plains, overprinted by the modern landscape of the Blackfeet Reservation. Complete drive line systems included more than simple V-shaped features, and in some cases appear to encapsulate entire basins in a predictable manner. We discuss the subtle monumentality and complexity of these ephemeral features in relation to intensified bison hunting during the Old Women’s phase.